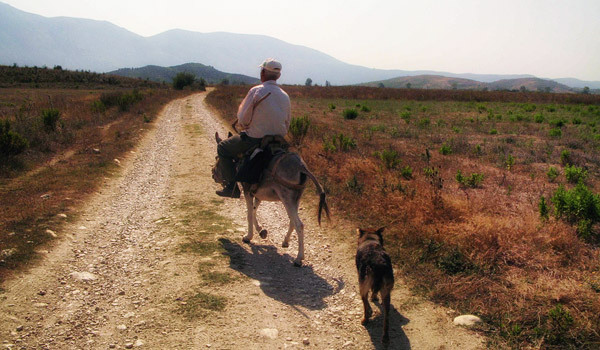 Radhime which lies between Vlore and Orikum in the Albanian Riviera is known for it’s beaches and hotels but the village of Radhime perches above in quiet solitude with it’s superb views. This walk takes you there by the back road to Tragjas. There seems to be a natural link between the two villages and we exploit what appear to be ancient paths to reach the lofty village of Radhime. Length: ~11km one way, wavy: 4km to Tragjas, 5km up the hill, 2km to Radhime village and the Corniche. Options at Radhime for return. The new and dangerous highway from Orikum to Tragjas as well as the National Highway are avoided by taking a dried up river bed to find the old back road to Tragjas. At Tragjas you can turn left and might snack in the friendly shaded bar and garden before carrying on up the hills on the ancient paths to Radhime. You will have stunning views in all directions as you head along the base of the mountains sweeping up beside you to your right . When you come out from the back road to Tragjas we turn left but a right turn heads for the winding road to the amazing, abandoned Tragjas e Vietjer – (Old Tragjas ) the subject of another walk. 1. The Orikum Cement works is the unlikely reference point for this walk. Earlier points along the highway have sadly been recently built over or blocked off. I suggest you avoid the dangerous National Highway by taking a taxi to the Cement works ( CIMENTO PUNON ) from the top of Orikum main street. You will pass the Alpert Garage on the left . On the left about 1KM towards Llogara and Dukati is the Cement works set 100M back from the road. On the other side of the road opposite again set back is a new substantial 2 storey dwelling. Next to the Cimento Punon is a path . Follow the path, beyond the works, it leads across a dried up river bed before arching back on itself to the Tragjas path. Watch out for the concrete walled garden (see photo) the path runs down the side at right angles to the river bed. 2. Take this path. On the foothills in the distance you should see the houses of Tragjas, in the direction we need to go. 100M on you should pass a farm on your left. 3. Carry on when you come to the next small junction, the road curves round and then straightens out again to head towards Tragjas. 4. After about 2KM you will find several paths to the right. Carry on past these. The first main one leads to the famous Gjon Bacari Castle which is about 2KM but I think you take a right fork 1KM along up the hill. Perhaps for another day. Watch out for the incongruous concrete Bunkeri at the foot of the hills. 5. Another 1Km or so you will see a few new houses right and left as you reach Tragjas. Carry on through. There is a river to the the left which I am told has drinkable water but best to visit the cafe bar ! The path opens out on to the main Tragjas Road. Right is Old Tragjas which is another walk . So turn left two blocks on is the picturesque bar and cafe it has a pleasant shaded garden. Unless you want to stop and enjoy this pleasant watering hole carry on. 6. Along the main road 500M from the café find the pink Mateo Hotel on the right on a mound, a few houses in from the main road. We need to take this rough road so walk up the hill past the Hotel. Take the first turning left on to a pleasant stretch carry on past several red houses on the right . At the end is a concrete walled compound and crossroads . Carry on directly past the compound up hill past the house on the right . Do not turn right but carry on up the hill . As you progress you’ll see the walled cemetery on the left. I’ve not explored this yet but it should be well worth a visit. Looking back towards Tragjas, from about 3km up the hill. 7. 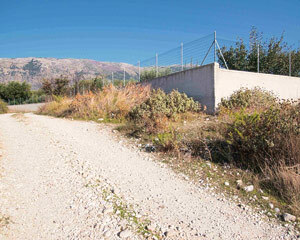 About 800M on past the walled compound you will reach a junction and the road improves slightly. The left takes you back to Tragjas and Orikum. We take the right which points towards the mountains and passes a settlement on the right. It should be about 400M since you turned off on to this path, it now turns left smoothly to head uphill towards Radhime. 8. The paths from here up hill should be fairly well defined just remember to keep left and head towards the large olive plantation 4KM further on at the top of hill. This route from Tragjas to Radhime has been used for centuries if not Millenia and should be relatively easy to orientate. There may be several paths but just use your sense of direction. You should have the curving sweep of the mountains to your right most of the time and early on tree topped hills to the left. 9. Towards the Olive plantation you should spot a farmhouse on a ridge to the left. This means you are near the end of the main path to Radhime. 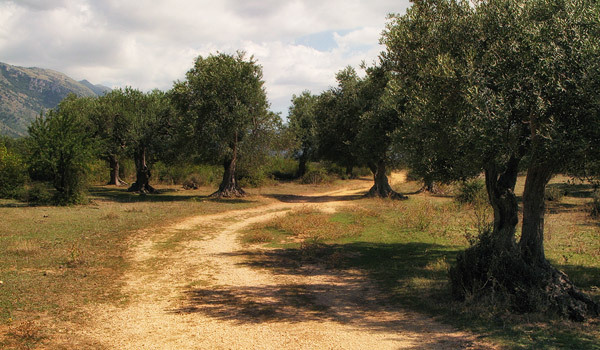 The path you are on runs close to the large olive plantation but towards the end you need to avoid the natural path right which take you round the back of the olives and keep on instead. Shortly the path should open out to houses. 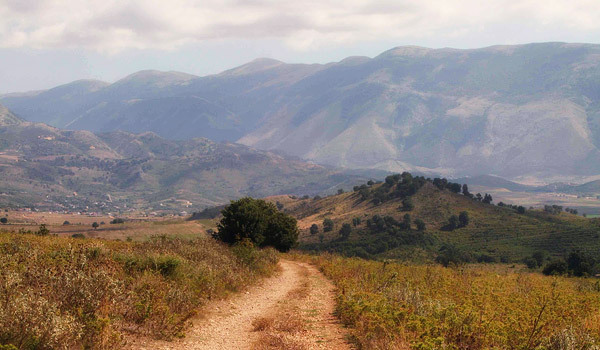 Path and olive trees near top – looking back towards Tragjas. There is a good path left for about 100M to reach the main tarmac road. At the main road junction, turn right and go up the hill. The left option takes you 2KM down the zigzag road to the beach. 10. Radhime village runs up hill and then levels out, it has a general dealer and bar. At the far end of the village is the prize of a spectacular view out to sea from the newly improved corniche where the road finishes. Radhime itself is not as interesting as Tragjas but the view from the top is well worth the effort. You can either return by the Tragjas path you came on or walk down the zig zag hill to the coast road 2KM to the bottom. You should be able to catch a cab or minibus there. It may be possible to find a taxi from Radhime back to Orikum.